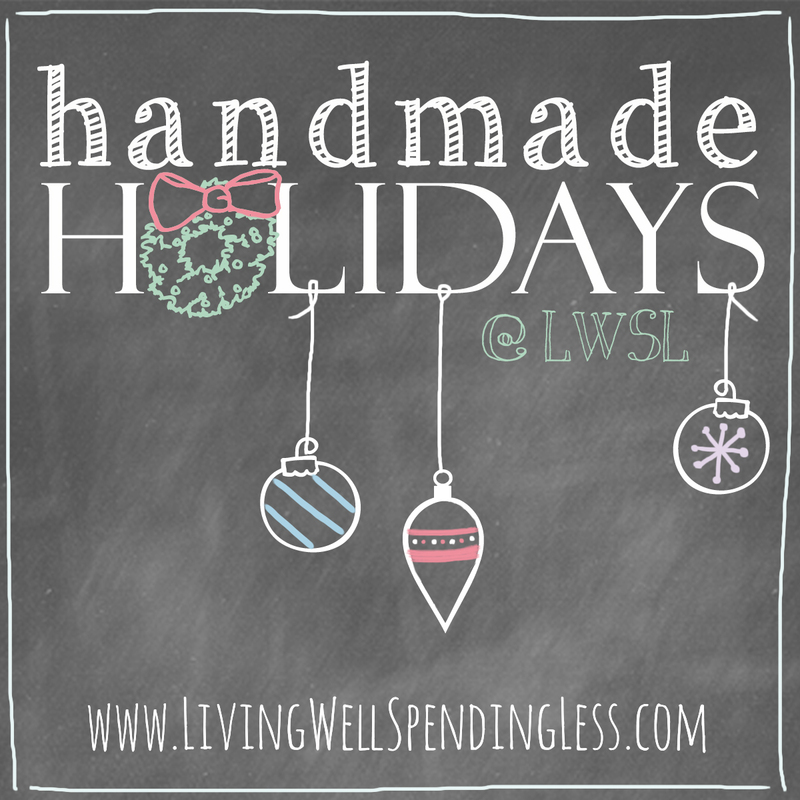 This year I am beyond thrilled to introduce you to a revamped series here at LWSL called Handmade Holidays! In past years I have shared my own holiday gift ideas, but this year I thought it would be fun to get some inspiration elsewhere. I asked eight of my favorite up-and-coming bloggers to share a simple and frugal handmade gift idea. 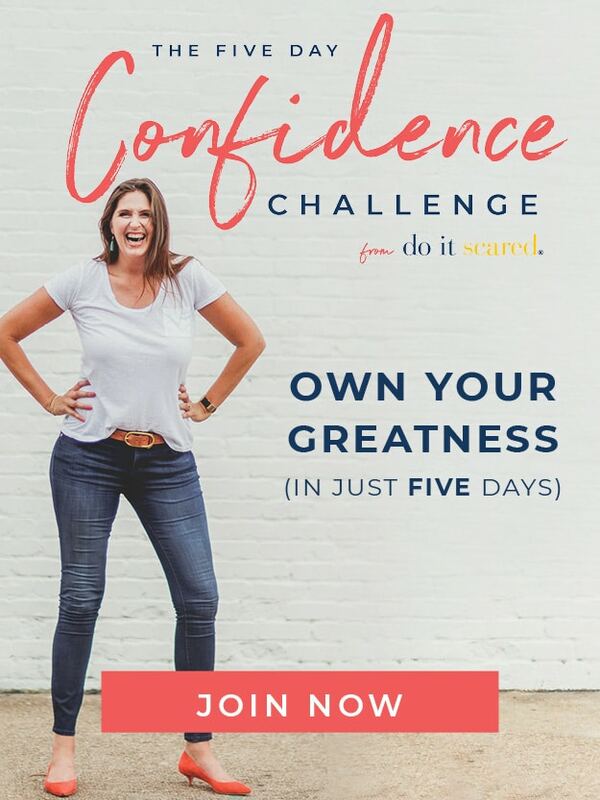 I was so blown away by all the amazing ideas they came up with, and I think you will be too. Each Monday, from now until Christmas, one of these talented women will be sharing their gift idea. Please be sure to welcome them here to LWSL, and to take the time to check out their blogs. You will be so glad you did! Hello! 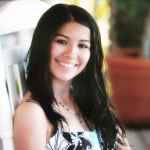 My name is Gabby and I am super excited to be guest posting at LWSL! 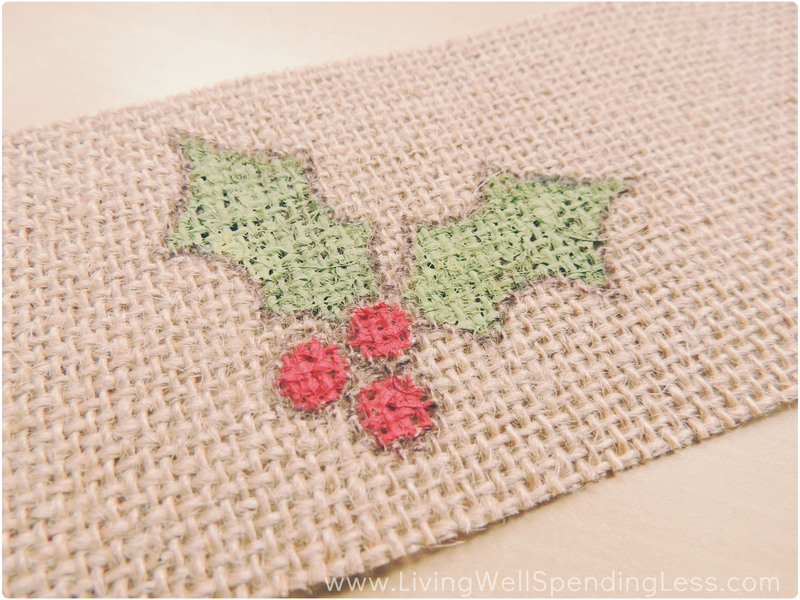 Today I’m going to be sharing with you how to make a quick, simple, and lovely handmade gift to give this holiday season! My go-to gift during the holidays is normally some kind of food: Homemade hot chocolate mix, fresh baked frosted cookies, cherry cheese bread, peppermint bark, fudge…and the list goes on! I love giving these sorts of tasty gifts (and receiving them too! Yum! ), but sometimes sweets are not quite the right fit for that special someone you have in mind. If this is the boat you find yourself in this holiday season, then I just might have a great gift idea for you. There are three reasons I love giving homemade mason jar candles to friends during the holidays. First, they’re a surprisingly customizable: there are many different fragrance oils and colorants to choose from, and you can decorate your jar however you like! Step 1: Begin melting your wax. For this project I used soy wax that I melted in a make-shift double boiler made from a saucepan and a pyrex bowl sitting over it. I planned to fill one pint-sized mason jar, so I melted approximately 14 ounces of soy wax (I purchased a 1lb container of soy wax and had very little left over). I melted the wax on low to medium-low heat. Never leave melting wax unattended! 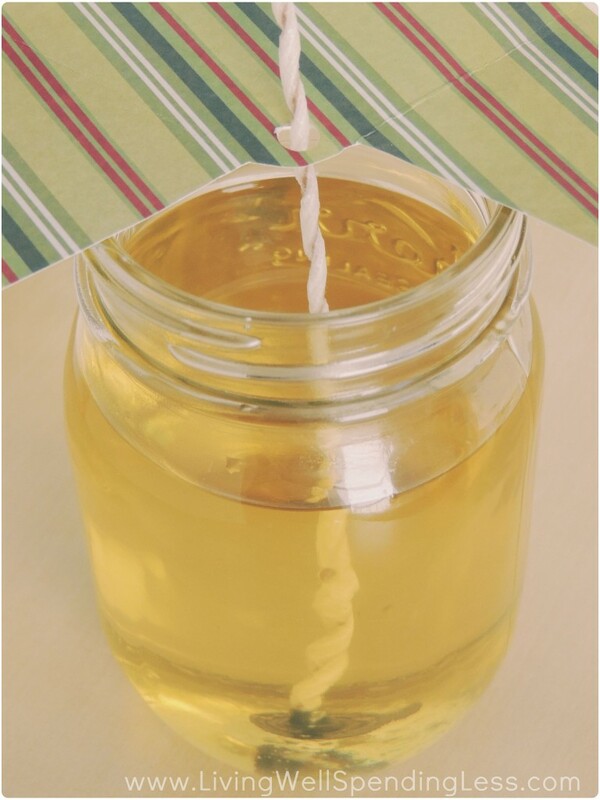 Step 2: While this is melting (and while you’re keeping an eye on your wax), secure your wick to the bottom of your mason jar. 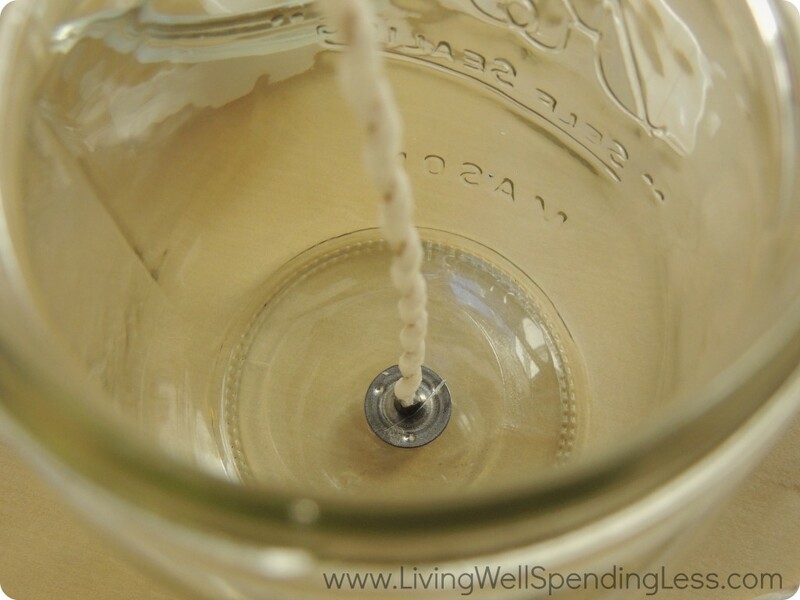 Apply a bit of hot glue to the center of your jar and hold it in place until it dries. 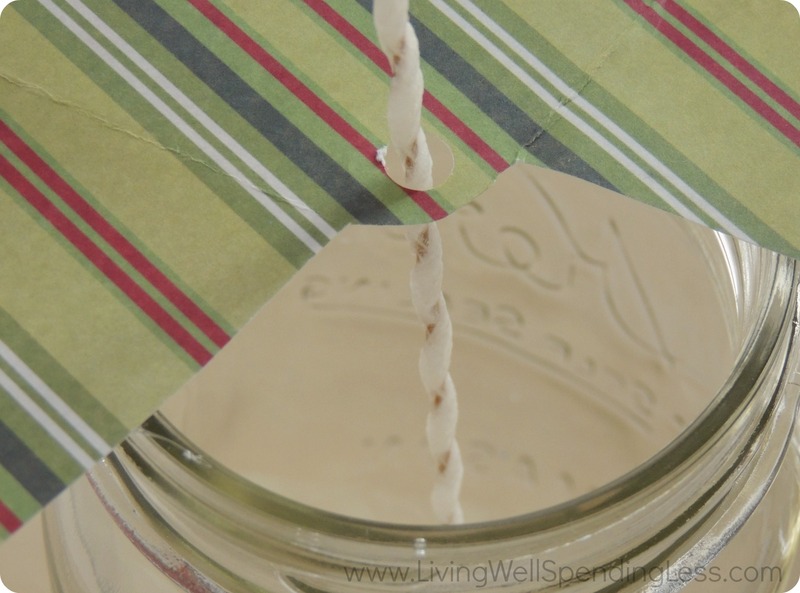 Step 3: Arrange your wick such that it stands upright. My wick was a bit stiff and stood upright reasonably well on its own, but I didn’t want to risk it falling over when it was sitting in a jar of hot wax. I ended up taking a piece of leftover thick card stock, cutting it into a circle, hole-punching the center, and then cutting away a section of the circle so I would have room to pour my hot wax. I then put a dab of hot glue on the rim of my mason jar and glued the card stock down so it would not get bumped off accidentally. (Fortunately, dried hot glue applied to glass is relatively easy to peel off when you’re done!) This is just one of several ways you could balance your wick—there are no rules, as long as your wick is standing up straight! To speed up the cooling process, I poured my hot wax into a room-temperature pyrex measuring cup with a spout. 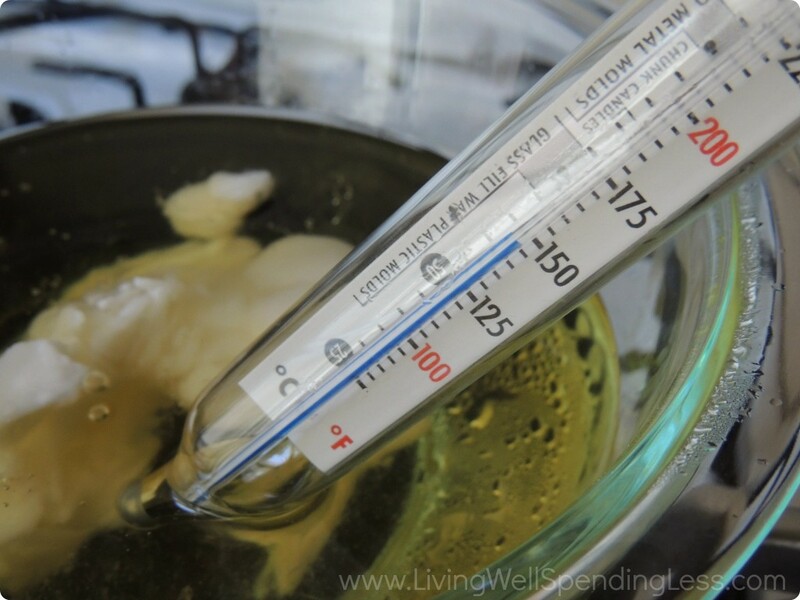 If you purchased a fragrance oil or colorants designed for candle making, it should come with guidelines as to how much of each to use given the volume of wax you are working with. I ended up using approximately one ounce of a Milk and Honey fragrance oil from brambleberry.com. Bramble Berry’s website also offers a guide that suggests how much of their oils to use in a given project. Step 5: Pour your wax into your mason jar and allow it to cool. Step 6: When your wax has cooled completely, trim your wick to about 1/2”. And viola! You have a lovely scented mason jar candle! …before painting it with acrylic craft paint. From there, I simply used hot glue to affix the burlap to the jar and tied on a twine bow. And there you have it! 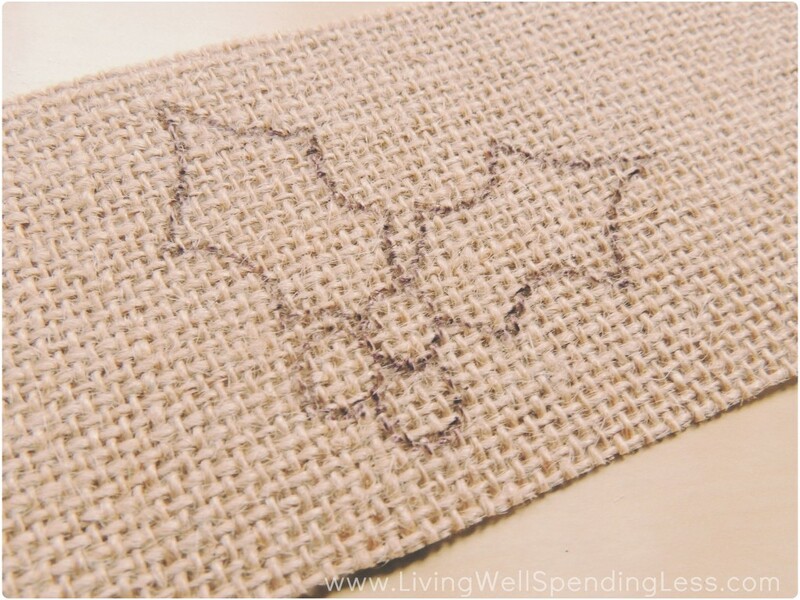 An easy project and a lovely finished product. I hope you enjoyed this tutorial! Gabby Whitaker of Essentially Eclectic is a DIY/craft/lifestyle blogger from Phoenix, Arizona. 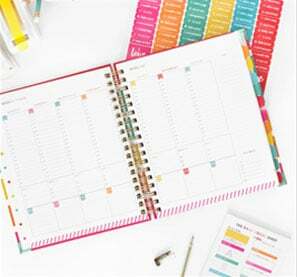 After moving to Boston, Massachusetts in the summer of 2012, she started blogging as a way to share her crafting creations, cooking escapades, and adventures in Boston with friends and family across the country. Some of Gabby’s favorite things include chai lattes, Downton Abbey, cozy bookstores, Netflix marathons and, of course, blogging! What a great tutorial! Love this idea & can’t wait to try it. Thanks! I’ve never tried making homemade candles before. But after reading this tutorial, I may just give it a try. You make it seem very easy. I’ve always wanted to make my own candles, but never have. In order to get really strong smelling candles, can you use more of the scent? It’s so frustrating when candles smell good in a store, but you get them home and burn them, and there isn’t much scent. Also, does the wax peel easily off your tools, or do you have to dedicate a dish to candle making? Thanks! U can put anything with wax in the freezer and it should pop right out. Pher wise dishsoap usually breaks wax down. One more tip……wax on cloth or carpet u place the wax area with a paper sack, atwoel over the paper sack and iron the area on top of the towel. The wax should melt / soak into paper sack. 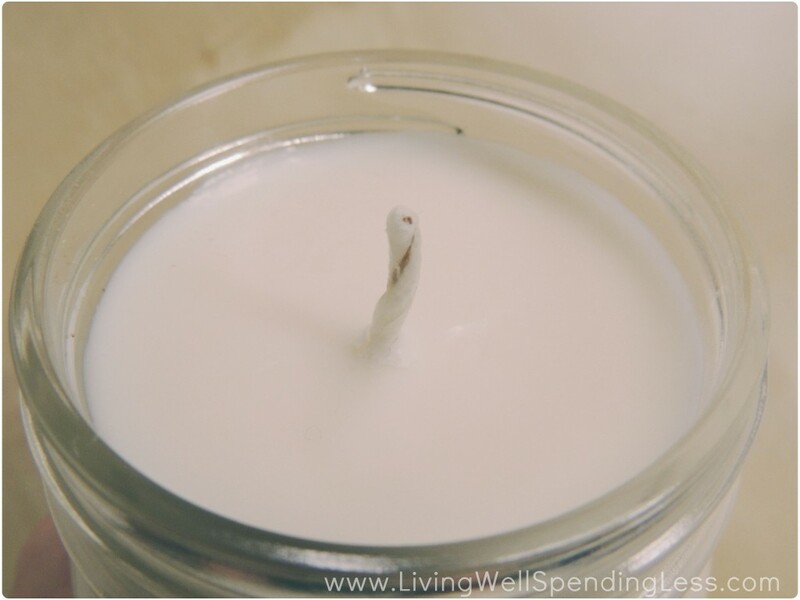 Try using fragrances specifically designed for candle making – these have the best “throw”, which is the term used to describe how well and strong they smell when burned. Soap or other bath product fragrances may not have as good a throw as candle fragrances. It will probably be fine to use more scent than a recipe calls for, as long as it’s a reasonable increase – for example, tripling the amount would be too much. 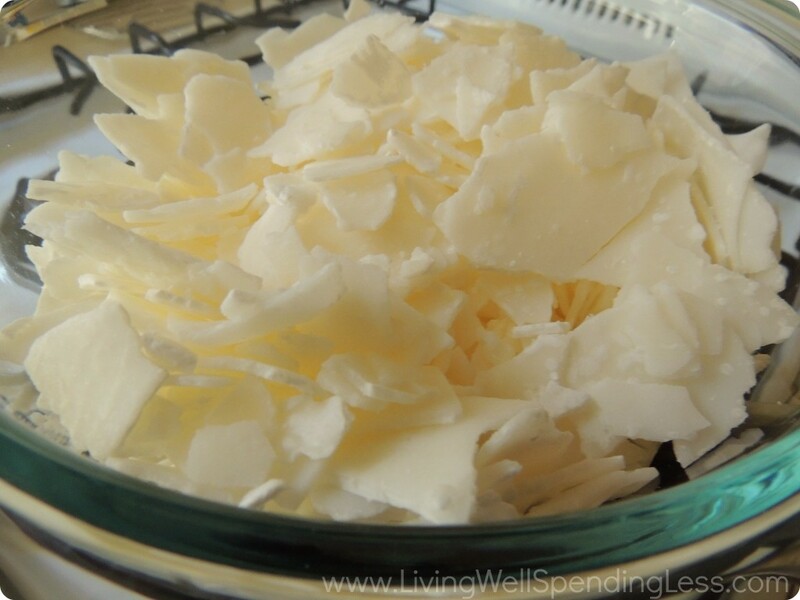 Part of the fun of soaping and candle making is that the crafter is free to alter recipes to his or her unique tastes. I made scented candles for all my family last year, went down so well! This candle is a lot better looking though! Now it’s just deciding what to make for this years festivities! 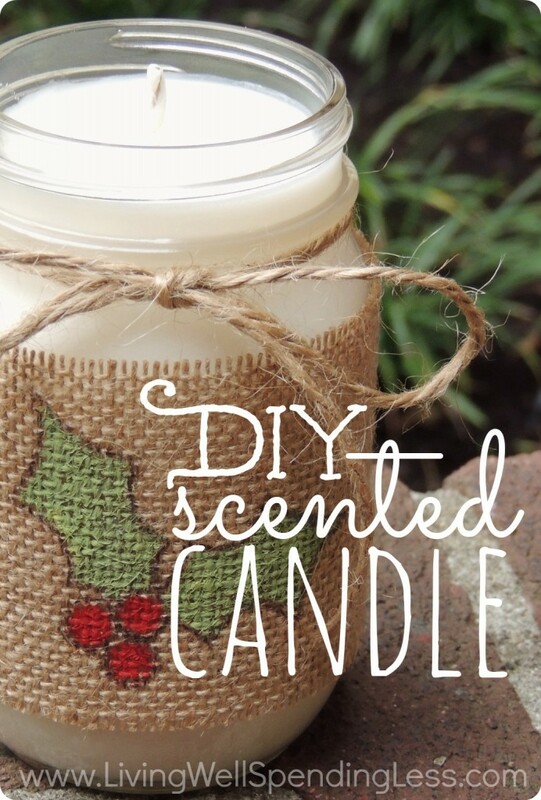 I love handmade gift ideas and I am curious to make this scented candle for this Christmas. You have provided me great idea as I am thinking to make some unique and special thing and making homemade candle is the best idea. Oooh! I have been debating what to give my sister in law and mother in law for Christmas (I’m going completely DIY this year) and I think I have my answer now!! Thank you so much for this awesome tutorial! Great tutorial, I look forward to trying it! What’s your trick for not having the wax SINK IN THE MIDDLE? Great question! I found that if you let the wax cool enough before you pour it (so not SO cool that you can’t pour it but not right-off-the-stove-hot either) it won’t sink–at least, it didn’t for me! Alternatively, you can pour your wax most of the way (3/4 or perhaps a bit more), let it solidify, poke small holes (like with a toothpick) into your wax, and then pour the rest of your melted wax in and fill to the top. (Why the holes? Honestly I’m not sure, but that is what The Google says!). Hope that helps! Thank you! I made my first candles over the weekend. One of them sunk in real bad. Now I know what I did wrong. My wax was straight off the stove hot. Thank you again! Thank you for the awesome read! Um Yes We Will Need AW Those Things, so that means help me please ! Peaches and cream: richly scented reed diffuser. Our reed diffusers are highly fragrant and come with ten reeds. This is a fabulous idea, I am definitely going to start making these early on time for the holiday season!! Love DIY items, i’m all about candle holders as well, they are also great gifts. Question: I want to know how to make my melters white. I use a vegetable blend wax & then scent. If I don’t add any color (color block) it is a dirty white. What am I doing wrong? Any ideas? Do I add a bit of soy wax to it to fix this, I think my vege blend wax has some soy in it. ??? Help? Thanks. I made this candle, waited until it was 130 degrees Farenheight (sp?) to pour into the mason jar, and it still had a sinkhole in the middle…what am I doing wrong? I want to give these as Christmas gifts and not have a sinkhole. will a craft store like michaels or hobby lobby have everything that is needed for this craft??? Rather than the card stock for holding the wick, I used strips of masking tape, poked a hole for the wick, taped it to one side of the jar, poked the wick through, then taped to the other side of the jar, brought the tape back over (sticky side up), and stuck the end of the wick to it to hold it. Just a suggestion. No glue needed. I was curious if you could give me an approximate cost of the candle you made? 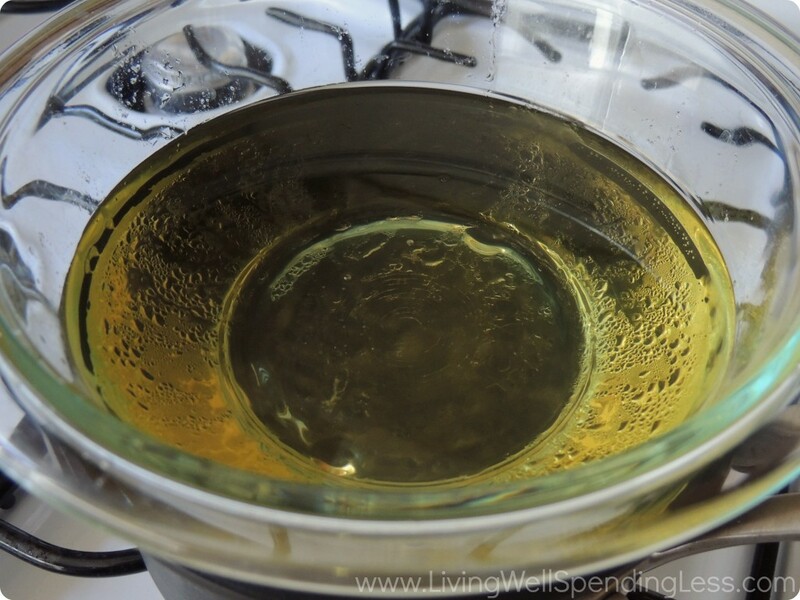 Soy wax DOES NOT work with essential oils, just a FYI; they do not mix. What kind of colorant should I use? Can I used regular food coloring? How much will it cost to make this candle? Can I get these supplies at Wal-mart? What should I use to color the candle? 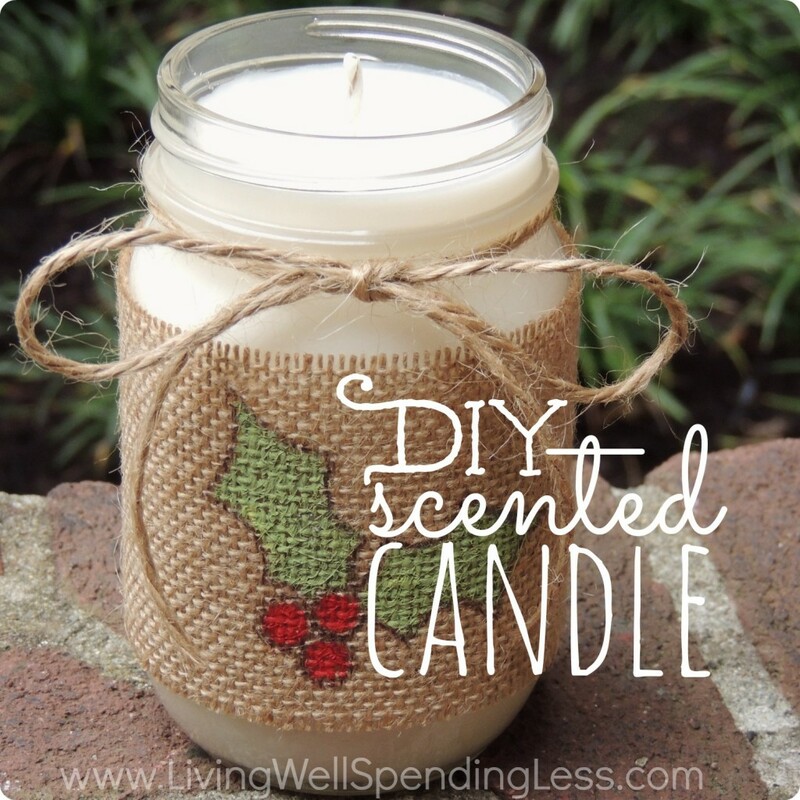 I had no idea you could make your own scented candles, love this idea! Will definitely give it a go, thanks for sharing! what a crafty idea, definitely must give this a go! I like the comment about using chopsticks to keep the wick straight. I have always used masking tape as well. This diy candle project is easy to handle. 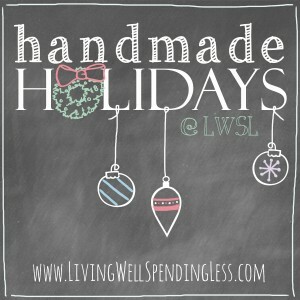 great post about making the handmade candle holiday gift. this post show that in a very easy way..